Every weekend hundreds of churches meet in rented movie theaters. Whether they are multisite campuses, church plants or established churches, movie theaters continue to be a great choice for churches that need a place to meet. 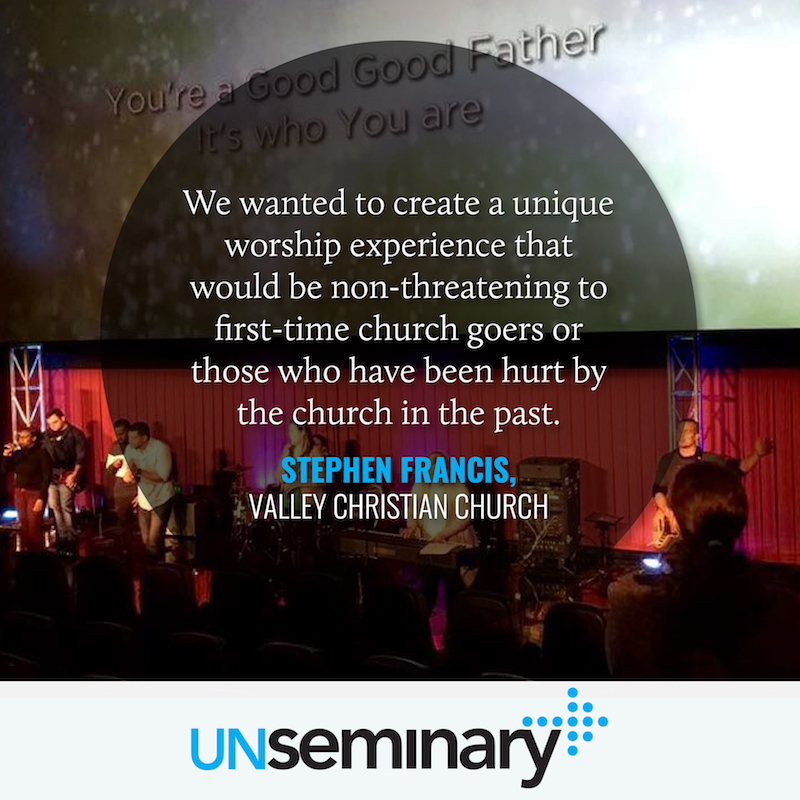 Recently, we talked with 12 leading movie theater churches and today we’re sharing what we learned for the benefit of other church leaders considering meeting in a movie theater. 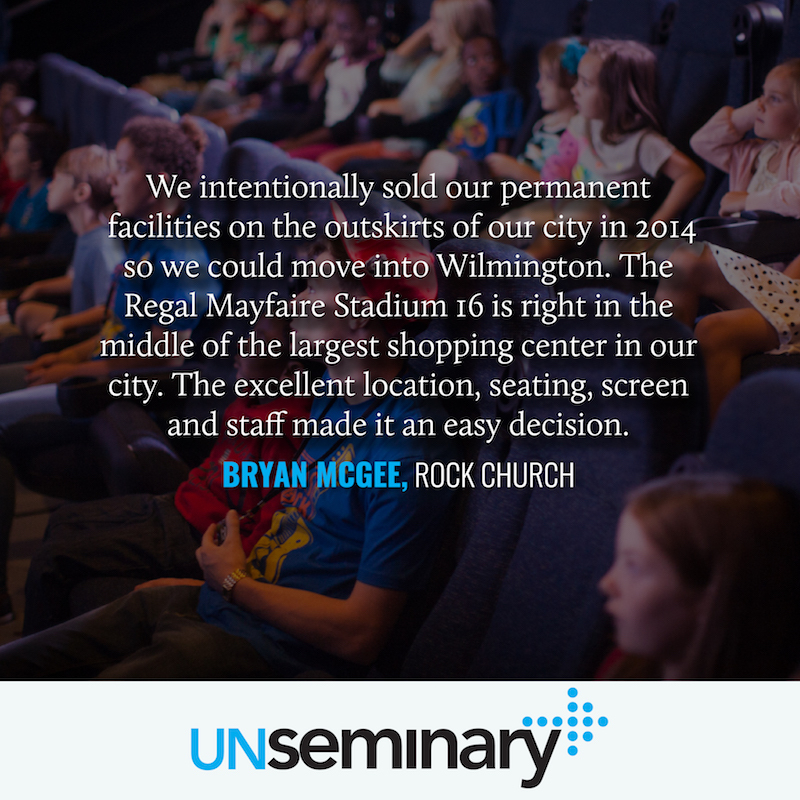 We recommend that you connect with the team at Regal Theater Church because they have dedicated staff ready to help church leaders who are wondering about using one of the 400+ theaters they have available this weekend! They are the industry leaders in serving church leaders who rent theaters. 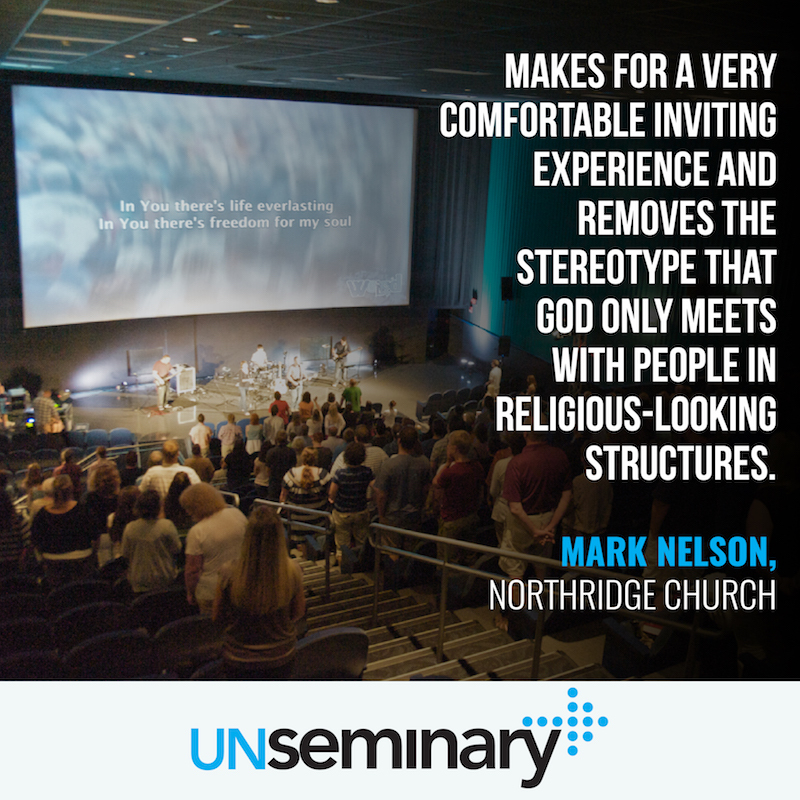 Culturally Relevant // When a church chooses a location for its next campus or church plant, they often consider schools and movie theaters. Movie theaters are a great option because the people we’re attempting to reach have more positive feelings about them than they have for schools. Be honest: Would you rather revisit your middle school cafeteria or the place you saw your favorite movie? As a local church, you can leverage these positive feelings when people invite their friends to attend! Easy to Find // Church is a retail “business.” We need to be found easily in the communities that we serve. The organizations that own and run these theaters spend a lot of money to ensure that the city you are attempting to reach knows the theater exists. We get to ride on the coattails of that spending. Typically, movie theaters are the anchor of a larger development in the center of a community. When people describe where your church meets, the people they invite will know where it is … that isn’t typically the case with other potential locations. Flexible Locations // The needs of a growing church often shift and develop over time. Renting from a movie theater gives you the opportunity to grow into what you need. There is usually an ocean of parking at these locations, which will accommodate your church for a long time. You could possibly start your adult service in a smaller auditorium and then shift to progressively larger rooms as you grow. Most churches don’t rent all the spaces and so you can add more rooms as your ministry develops over time. Economical // Renting movie theaters for your church is surprisingly inexpensive when compared to schools, hotels or other options. In fact, many church leaders who rent movie theaters feel like it’s the best-kept facility secret … they feel like they are getting away with something! Many theater companies see this as an augmentation of their revenue stream during a time when they can’t make money in their core business. They are pleased to have the extra revenue but aren’t looking to gouge anyone. Theaters also see it as a plus that your church will bring people to their locations. Take Church to the People // Take a look through scripture and it seems like God’s preference is to reach people in the marketplace rather than in holy places. Moses was tending his flock when God spoke through the burning bush. Many of the prophets in the Old Testament stood in the city square to proclaim the word of the Lord. Peter was fishing when Jesus gave him a new vision for his life. Paul was on the road going about his normal routine when he was called to change his life radically. By meeting “in the marketplace,” you put your church in the midst of where people go about their daily lives. You’re taking the mission to the people rather than asking people to come to you! Build Management & Staff Relationships // Work to build strong relationships with both the management company and the staff you’ll interact with on Sundays. Understand that the management has a clear motive to make more money for their business … so find ways to reduce costs and stress for them. Go out of your way to care for the staff serving you on Sundays. Bring them coffee just the way they like it or offer to cater a meal for an all-team meeting the theater is hosting. These two prongs of relationships are vitally important for making theater church work well. Regal Theaters has a dedicated team at the corporate office who only works with churches like yours … reach out to them for more information! Embrace the “Publicness” // You are going to be doing church in a very public forum. Some weeks there will be large stand-up advertising for the latest blockbuster. Moviegoers may be lining up to see a Sunday matinee as your team is cleaning up. You’ll need to work with the theater to exit the building on time on Sundays so they can open. Rather than seeing some of those minor inconveniences as major annoyances, make sure people see them as a great opportunity. What a privilege to work so closely with a place where people love to come! Think Through Kids’ Environments // One of the challenges of doing theater church well is hosting great kids’ environments. More specifically, some leaders might feel like doing infant or toddler programming well could be a problem. In fact, I felt the same way when we started on our journey in theater church so many years ago. But with a little innovative thinking, you can turn this into a win. What kid doesn’t love going to the theater? Empower an Environment Team // There are great leaders in your church who are waiting to connect to the mission, but they don’t fit easily into leadership because they love working with their hands. Often these tactical- or logistical-minded leaders struggle to find a place because we don’t require these skills in a typical “brick and mortar” church. These leaders will thrive in your theater church if you release them to use their skills in the set up and tear down side of transforming the space. They will geek out making it great if you let them. Trust me, you’re going to find some amazing leaders who will jump in and thrive in this ministry area.